Winter bugs are tough for anyone to deal with, but are especially hard for someone with a long-term disease like fibromyalgia syndrome, which causes aches and pains and long-term fatigue. Winter bugs include colds, flu and the winter vomiting virus – a highly infectious virus that causes sickness and diarrhoea. During any outbreak of flu and other winter bugs, it is a good idea for everybody (whether they have fibromyalgia syndrome or not) to get into the habit of washing hands regularly, including people suffering from the winter bugs. If water isn’t available, use an alcohol-based hand sanitiser – these are widely available from chemists and supermarkets, and are not expensive. If at all possible, avoid people who obviously have flu or other winter bugs – though this is not always practical, especially if close family members are ill and need looking after. Wash towels regularly (or ask someone else to), and get the cold or flu sufferer to throw used tissues away rather than leaving them around. A flu vaccination is may be a good idea, especially for people who have other health issues on top of fibromyalgia syndrome, such as diabetes, asthma, chronic obstructive pulmonary disease (COPD) or heart disease. Some people may find that a flu vaccination triggers a fibromyalgia syndrome flare, so should discuss with a doctor the balance between the importance of avoiding flu and the risk of a symptom flare. Antibiotics will not help with viruses, such as colds, flu or the winter vomiting virus, unless there is a secondary infection such as a chest infection. 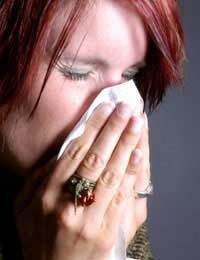 For bouts of flu, however, there are antiviral medications available on prescription – go to the doctor at the first signs of flu to ask whether these might be helpful. Generally, coping with bugs is the same for people with and without fibromyalgia syndrome – rest, get plenty of fluids, and keep warm. Replacing any fluids lost through not eating or after diarrhoea or sickness is vital. It is especially important to eat well when suffering from winter bugs, even if the illness reduces the appetite – try plain, nutrient-filled foods like chicken soup, made with plenty of fresh vegetables. Over the counter medications like cold remedies, or simply ibuprofen or paracetamol, will help with cold and flu symptoms – but check that these will not interact with existing prescription medications. Unless someone with diarrhoea and vomiting is running the risk of becoming severely dehydrated, it’s probably better not to use drugs to stop this – it will speed the body getting rid of the virus and any toxins caused by the virus. Keep drinking clear fluids. A winter bug may promote a fibromyalgia syndrome flare, so it might be a good idea to postpone any major plans for a few days at the first symptoms of the bug, or at least warn friends and colleagues that the bug might trigger extra fibromyalgia syndrome symptoms. It is also worth talking to the doctor about possible winter bug-related flares, to see if any extra fibromyalgia syndrome medications would be helpful.